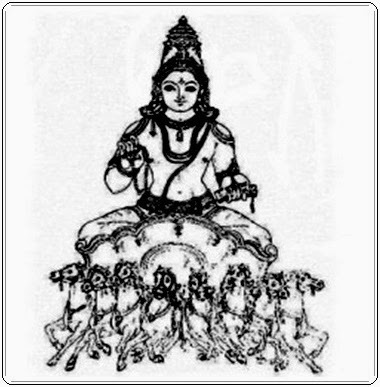 According to Hindu mythology Jupiter is considered to be the teacher of gods or Devas. In Vedic astrology, the planet Jupiter is known as Guru, Brihaspati and Devagura. As a God Brihaspathi is a handsome youth with a big-bellied body and a broad chest. Brihaspati is a Brahman by birth and son of Sage Angirasa (and grandson of Brahma) and Surupa. He is the teacher of Gods and knows the Vedas and is an expert in all forms of knowledge. Brihaspathi is four armed and wears yellow cloths and is very fond of sweets. He sits on a lotus and his chariot is pulled by eight yellow horses. Afflictions to Guru or Brihaspathi can mean bad luck, loss in litigation, skin problems, arthritis, heart troubles, impurity of the blood, liver malfunction, diabetes etc. One can chant the Mantras of Guru in case of afflictions or do other remedies.